– I have been completely blown away by this conference. This was put together professionally and with great thought. Thank you for doing this Boot Camp and being willing to educate us! Day Egusquiza, you are an exceptional chair!! – Rarely, if ever, have I attended a conference with such consistently good speakers. – The content was consistently PA-UR but the varied perspectives of speakers provided a 360 degree approach — excellent! – I believe a lot — a whole lot — of the excellent feedback is due to the thorough planning and the professional execution of The Boot Camp. The participants both in person and online were treated respectfully. I have attended more than 100 CME conferences over 35 years and respect for the audience’s needs and time was lacking in most. – Congrats to you both for putting together the best PA conference I’ve ever attended, and I’ve attended quite a few! – First of all, thank you for a wonderful educational opportunity. I learned so much. More appropriately it confirmed much of what I already thought and envision for my institution. Perhaps I can use this knowledge and new found energy to bring my administrators along into this “new age” a bit more quickly and with some urgency. – Fantastic conference – can’t wait to go to another one! Simply register, travel to the conference city and attend in person. Watch the conference in live streaming video over the Internet and at your convenience at any time 24/7 for the six months following the event. 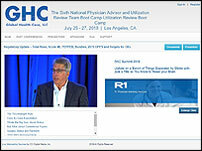 The archived conference includes speaker videos and coordinated PowerPoint presentations. 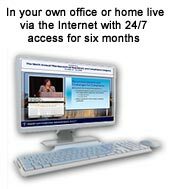 Pros: Live digital feed and 24/7 Internet access for next six months; Accessible in office, at home or anywhere worldwide with Internet access; Avoid travel expense and hassle; No time away from the office. The 2018 Sixth Physician Advisor and UR Boot Camp conference content is now available in a variety of formats. You may now purchase the packaged Physician Advisor and Utilization Review Team Certificate Program, which includes preconference readings and online courses, the conference video with synchronized PowerPoint presentations and the post conference online exam. This content is perfect for corporate compliance training programs and can be purchased at deep group discounts. Alternatively, you may purchase just the Summit streaming content in the following formats: Flash Drive or online archive (6 months access). Online Archive of 2018 Sixth National PA/UR Boot Camp Presentations today! Flash Drive of 2018 Sixth National PA/UR Boot Camp Presentations today! In support of improving patient care, this activity has been planned and implemented by Amedco LLC and Health Care Conference Administrators. Amedco LLC is jointly accredited by the Accreditation Council for Continuing Medical Education (ACCME), the Accreditation Council for Pharmacy Education (ACPE), and the American Nurses Credentialing Center (ANCC), to provide continuing education for the healthcare team. Credit Designation Statement – Amedco LLC designates this live activity for a maximum of 14.75 AMA PRA Category 1 Credits™ for physicians and 14.75 contact hours for nurses. Learners should claim only the credit commensurate with the extent of their participation in the activity. Compliance Professionals: Pending Compliance Certification Board (CCB) approval of CEUs. ABQAURP: This conference is pre-approved by ABQAURP to provide up to 14.75 continuing education hours to apply towards the Health Care Quality & Management (HCQM) certification exam eligibility requirements, or recertification requirements for ABQAURP Diplomates. Certified Case Managers (CCM®): Pending approval for CCM® credits. Accounting Professionals: Pending approval for NASBA CPE credits.